Raw Swiss Chard Veggie Wraps With Creamy Pecan Spread. I found this recipe on Vegetarian Times. Light, refreshing, and easy to make. Excellent for picnics or hot summer days when cooking seems impossible. A colorful lunch including all four of the main food groups. 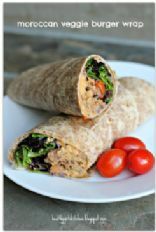 Packed full of protein this wrap should hold you through till dinner time, also makes and excellent post work-out snack.